The Hydraulic erosion node creates realistic erosion and deposition effects caused by rainfall and river flows. This simulation follows three basic rules: when water flows over terrain, it can erode it (i.e. carve rivers or at least weather the slopes); as water flows downhill, it transports the eroded materials with it; as the water settles out, it releases the suspended soil particles, thus creating sediment depositions. 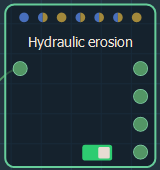 To add a Hydraulic erosion node, right click in the Graph and select Create Node > Simulation > Hydraulic erosion. 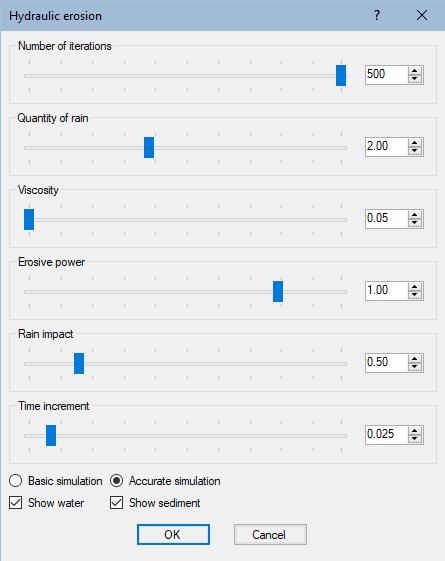 Quantity of rain: Quantity of falling water, in centimeters per second. 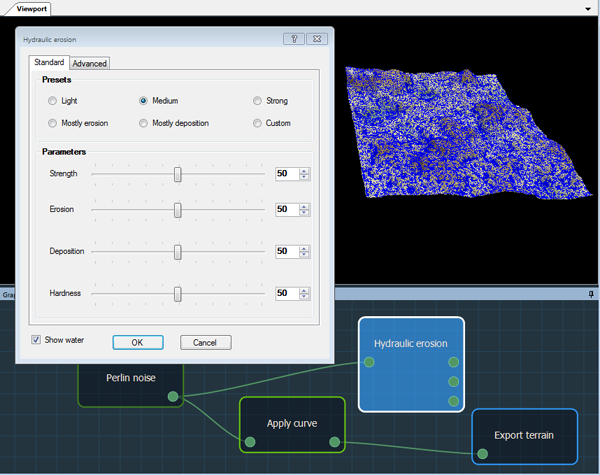 Viscosity: Change the fluid behavior and thus the erosion pattern. Erosive power: The higher the value, the more terrain will be eroded by the flowing water. Rain impact: Quantity of rock shattered by rain and transformed into sediment. Time increment: Time that elapses between iterations, in seconds. If this value is too high, the simulation may diverge and give incorrect results. The usual range of values is between 0.010 and 0.150 s (i.e. between 10 ms and 150 ms). Evaporation mask: Quantity of evaporated water, in percentage per iteration. Note that without masks, the evaporation rate should not be greater than the rain flux (or the water would not have the time to flow over the terrain before being evaporated). Deposition mask: This mask acts as a localized sediment sink, allowing the user to erode without sediment transport. Show water: This option is checked by default. Uncheck the option to view erosion without displaying any water on your terrain. Show sediment: This option is checked by default. Uncheck the option to view the node without displaying any sediment. 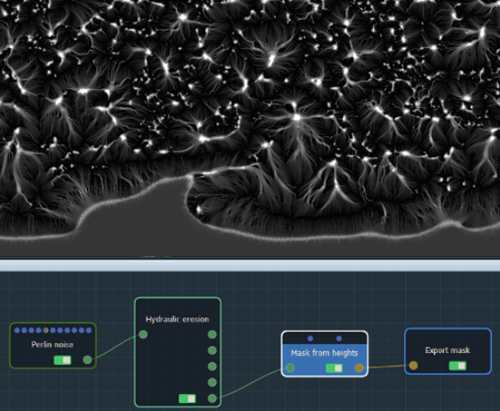 In order to export the flow map, use a Mask from heights node on the Water accumulation optional connector. Configure the Mask from heights node as an automatic gradient. Watch our Hydraulic erosion node video tutorial (video of the Instant Terra beta version March 2018). Some combinations of the Advanced parameters may lead to a divergent simulation.